Paradise apartments aim to live up to their name and ensure all visitors feel that they really are experiencing a taste of heaven! 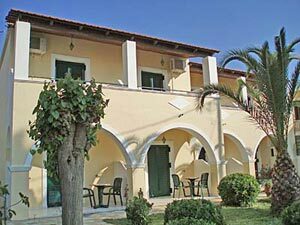 Located in a quiet area of the friendly resort of Alykes, these apartments are ideal for families and couples seeking a relaxing holiday on the beautiful island of Zante. Paradise apartments are only 10 m away from the beach, perfect for any water baby or sunbathing lover! 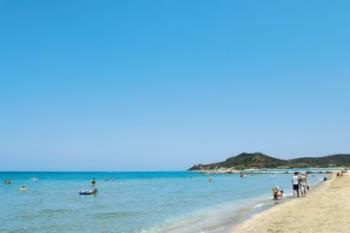 Alykes has a superb beach; one of the best on the island – a long stretch of soft golden sand with warm shallow waters, safe even for young children to play and swim as the water stays shallow until along way out. The resort of Alykes is small and friendly, with a good range of bars, restaurants, tavernas and shops ensuring that even when the sun goes down there is plenty to do for fun and memorable summer nights. Spiros and Marietta await your visit, to help you have the best holidays yet! Paradise apartments consists of 16 spacious studios suitable for 2-3 persons. Each studio has comfortable single beds. 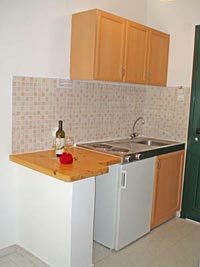 The studios have a fully equipped kitchen with all necessary utensils as well as a kettle, refrigerator, toaster and coffee machine. All studios have their own private bathroom complete with w/c and bath. Air-conditioning, safety deposit boxes and hair dryers are provided in every studio and mosquito screens have been fitted throughout. Every studio also has its own private large balcony with table and chairs; the ideal place to enjoy the stunning sea views and to soak up the beautiful Zakynthian landscape…. simply paradise! We understand that holidays are often the only chance in a whole year for families and couples to unwind and enjoy some relaxing time together and we hope that our numerous facilities help with this, so all our guests can make the most of their precious holiday time! For those feeling active we have a tennis court, swimming pools and a pool table, but if you would rather watch others competing we have a large screen TV - so you won’t miss out on any sporting events. Our snack bar with a delicious range of drinks and tasty snacks is open all day long. Paradise apartments are located in a quiet area of the resort of Alykes, in the north of the island. Just 10 metres from the beach, what could be better? All amenities are close to hand, with a mini market catering for all your daily needs just 100 m away and the resort centre only 400 m away. Alykes is connected by bus route to Zante Town, ideal for anyone wishing to do some sightseeing or shopping and for those that really wish to explore the island car rental can easily be arranged. A boat leaves 4 times a day for the famous Blue Caves and the Shipwreck and the departure point is only 300 m away from Paradise Apartments. and we will reply to you as soon as possible.